A slow moving stream of tears rolled down my face toward my chin. A single drop hung there waiting for its partner to make the journey down to the cool concrete floor. The tears land with a quiet thud joining a handful of others that had fallen before. I have never cried during a tattoo, but today I am. It’s not an uncontrollable balling with shrieks of pain, just silent tears… It doesn’t even hurt that much!?! Why am I crying? Maybe he was right, it hurt, sure – but I wasn’t crying from the pain. I honestly don’t know why I was crying, it only lasted a few minutes and before I even realized, he was finished. I wiped away the tears and a few more taps with his needle and my tattoo was finished. Did I really just get tattooed by a monk? In Thailand? Five years ago if you were to tell me I’d be living in Thailand I’d call you crazy, and if you said I’d be getting tattooed by a monk I’d tell you to seek help. Isn’t it crazy how life changes and how travel can change you? Thailand is more than just a destination to us. Adam and I first visited Asia on our Thailand honeymoon in 2012, and have been drawn back to Thailand over and over again. We’ve spent over a year traveling around Thailand and have made Chiang Mai our second home. I’ve always wanted to get a tattoo in Thailand to remember our time here. Sure, I could have gone to a bamboo tattoo shop and gotten a tattoo of my choosing, but I wanted my tattoo to mean something. I wasn’t sure what kind of tattoo I wanted to remember our travels here in Thailand, but when I heard about a magical tattoo given by a monk, I knew. A tattoo with a meaning, a story, history, and possibly some mystical powers. I have met a handful of other travelers who had gotten one and had amazing stories. A Sak Yant tattoo will be a permanent reminder and something to always hold on to the time we spent in Thailand. Sak means to tattoo or to jab, Yant is the Thai word for Yantra or a type of mystical diagram. When I told my mom I was getting another tattoo she wasn’t super happy and I think my dad told me to sleep on it. Well, Dad, I slept on it and I would do it all over again. I had to explain to them what was this magical tattoo and why I wanted one. Sak Yant is also known as Yantra tattoo or Sak Yan (the “T” in Yant is not pronounced in Thai). A traditional Sak Yant is done by a Buddhist monk or Ajarn with a metal rod (no machine tattoo gun here). Yantra tattooing is an art, the Ajarn hand-etched my tattoo. The monk who did our Sak Yant tattoos had been giving these magical tattoos for over 20 years. At just 14 years of age, he started training under the most well know Sak Yant Ajarn in all of Thailand. He studied for many years and now he practices out of his samnak which is a traditional Sak Yant studio which has been built at his home, so he can care for his aging parents. His years of practice were apparent with the speed at which he worked. Ajarn Rung literally drew five lines and the rest was freehand. More on Sak Yant designs below. You will notice some monks in Thailand are covered with Sak Yant tattoos. Yantra tattooing has been around for over 2,000 years and is still practiced today in Thailand. Sak Yant tattoos are believed to give magical powers such as luck, money, good health, family, protection, etc. Originally Buddhist monks tattooed warriors who needed protection and strength during battle, but now anyone can get one. Some people would say this is similar to a witch doctor or even a psychiatrist who will prescribe something to help you. If you have ever seen Angelina Jolie’s tattoo on her back shoulder and wonder what it was, it’s a Sak Yant tattoo. And no, I didn’t get the same one as her. After a little convincing, a magical tattoo to protect me while traveling was approved by mom. Depending on where you go to get your tattoo will determine your Sak Yant design options. There are still temples around Thailand that offer “free” Sak Yant tattoo (offering is ALWAYS expected see below), where people line up daily to visit the Ajarn (master monk performing the tattoo) to get their magical tattoo. If you go to one of these temples the monk will most likely not speak English. You will have no control over what tattoo you are getting or where on your body it will be placed. We booked the Lanna Ink Experience in Chiang Mai where we had an English speaking guide there for us to translate our whole experience. We were able to tell Ajarn Rung what we would like protection from and what we are struggling with. He then had binders of Sak Yant designs for us to look at, our guide explained the meaning of designs that interested us. I opted for a design that wasn’t in the book. Ajarn Rung was able to take the general idea of one of the designs I liked, but then customize it to what I needed protection for. I told the Ajarn anywhere on my back was ok, he asked me if I was right or left handed and chose to put my Sak Yant on my right shoulder. After the monk sketched the perfect blessing for me it was time for the ceremony. We removed our shoes and entered. After speaking with our Ajarn we lit incense and were told to think about what we needed in our life from this blessing. A silent moment passed and we had our ideas in our minds on what we needed in life, and I decided something else too. I decided to have Adam get his tattoo first, that would delay my pain for another 15 minutes. How Much Does A Sak Yant Cost? The cost varies Ajarn to Ajarn, but if you’re visiting a temple then it would “free” with a mandatory donation. All Ajarns have a standard fee just like a tattoo shop, as this is how they make a living. The price varies on the size of Sak Yant design but ranges from 1,000 baht to 12,000 baht. If you do visit a temple offering “free” tattoos please leave a large monetary donation. You need to realize that the local Thai people give thousands of dollars over their lifetime to the temples and tourists should not expect to just walk in and get a free tattoo. Think of it like this, the minimum price of a tattoo in the USA is at least $50 so you should donate at least this in my opinion. It’s wrong for tourists to go to a country and reap the benefits locals have been supporting themselves with for their whole lives. We presented our offering to the monk and shortly after, Adam was on the ‘tattoo stool’. Naturally, I had him get his tattoo first. A monk is not supposed to be photographed giving a Sak Yant tattoo to a woman because he is not to touch a woman or see her exposed back. In respect to these wishes, you’ll have to just enjoy Adam getting his tattoo and not me! Adam also wanted me to mention that all that talk of crying at the start of this post was not him! Does a Sak Yant Tattoo Hurt? Do you think getting stabbed with a pointy steel rod for 15 minutes would hurt? Yes, it hurts. Does a Sak Yant hurt more than a regular machine gun tattoo? No, not in my personal opinion. This was my fifth tattoo, my other tattoos were all done at a tattoo shop in the USA with a machine gun. My tattoo on my ribs hurt way more and took three times longer. Everyone has a different pain tolerance and the pain level differs on what part of the body the tattoo is on. Many people say getting a Sak Yant on your shoulder is one of the less painful places, which is where mine is. There are two options: go with a reputable tour company – or – attempt to go on your own to a temple. I got my Sak Yant in Chiang Mai with the company WSE travel. They have a tattoo tour in Bangkok and Chiang Mai. I would highly recommend arranging your Sak Yant with them as opposed to trying to go about getting one yourself. We got ours at Ajarn Rung’s samnak, which simply means a salon for tattooing Sak Yant, aka his office. The most popular Sak Yant temple in Bangkok is Wat Bang Phra, which is located 30 miles outside of the city. It is also possible to get a Sak Yant in Cambodia, Laos, and Myanmar. If you are looking at getting a Sak Yant tattoo in Cambodia please note all the ajarns were killed during the Khmer Rouge. Those offering the tattoos now are self-taught and don’t come from the ancient lineage. My friend Ian who runs the Lanna Ink Experience spent a month looking for a reputable traditional ajarn in Cambodia to do similar Sak Yant tattoo tours in Cambodia, but couldn’t find one. Are Sak Yant Tattoos Safe? We have contemplated getting one for years, but we’re always nervous about the needle and if it was safe. Whenever considering something that involves needles and blood you want to make sure it’s safe. It doesn’t matter if you are in Thailand or the USA always make sure you’re in a sterile environment. One of the main reasons we booked our Lanna Ink tour was because they visit a trustworthy Ajarn that uses clean needles. If you visit one of the local temples like Wat Bang Pra temple in Bangkok, there will be tons of people lined up daily to get a tattoo with the same needle dipped into the same vat of ink. It’s risky and this type of Sak Yant is questionable when it comes to safety. I do however have a few friends that got their tattoos there and they are fine. Most monks or Ajarns now use a steel tip rod as opposed to a bamboo needle. Our local guide said he hadn’t seen any Ajarn or monk use a bamboo needle. Bamboo needles are less accurate, they break the skin, and are known to hold contaminants. Steel tip needles are more hygienic and have replaceable tips. The rods are called “Khem Sak” which means Khem=give Sak=tattoo, a very appropriate name. Khem Sak rods are often passed down to the Ajarn from their master and are believed to be loaded with blessings and enchantments. You may still see it advertised as a bamboo tattoo Sak Yant, but it will most likely be done with a steel rod. If you are specifically wanting a bamboo tattoo done with bamboo needle double check with your Ajarn. Can Women Get A Sak Yant? Yes, I am proof of that. However, not every monk will give women a tattoo. Thai Buddhist monks cannot touch women and therefore most monks won’t tattoo women. A few Ajarns will give women a Sak Yant while wearing a glove in order not to touch them. Most Sak Yant specialists are Ajarns and have left the temple and now give Sak Yant & Yantra tattoos for a living. Our Ajarn wouldn’t allow any pictures of me getting the tattoo. Some of these rules I will have no problem following and some of them are just not going to happen. Some believe if you break these rules you may lose some of the power of the Sak Yant. Thousands of people attend an annual Wai Kru Festival, where you can pay respect to your Ajarn and renew the powers of your magic tattoo. So in case, I’ve broken any of the rules above I can attend the festival to restore the power of my tattoo. There are a few other rules to take note of when getting a Sak Yant. The rules are mainly to not disrespect the monk. Like I mentioned above we went with WSE travel who have Sak Yant tattoo tours in Chiang Mai and Bangkok. I highly recommend going with them. This is their specialty, they have sought out the best and safest place to get a Sak Yant tattoo. Having an English speaking guide will make your experience so much more fulfilling. You will learn about the history of yantra tattooing, be able to explain to the monk what magic tattoo meaning you would like, understand what your tattoo means, and be able to communicate with the monk makes it worth it. Would I get a Sak Yant again? Yes, without a doubt I would get one again. Who knows, I may get another one with different meaning and powers. Have you gotten a Sak Yant tattoo in Thailand? Share your story below! If you’re heading to Chiang Mai check out our proclaimed best of Chiang Mai. Happen to be traveling during the Chiang Mai lantern festival? Here is the updated Yi Peng festival information. If you’re visiting between April 13-15th be prepared to get wet during the Songkran Festival Chiang Mai is the best place to ring in the Thai New Year. Bangkok is our favorite city in the world and a great place to kick off two weeks in Thailand. We always suggest spending 3 days in Bangkok to get a good taste of the city. Make sure to check out our where to stay in Bangkok guide to find the perfect hotel for you. Some of our favorites things to do in Bangkok is to eat lots of street food (read this street food safety guide first), watch the sunset at Red Sky Bangkok rooftop bar with great happy hour deals, people watch on Khao San Road, head to the bizarre Maeklong train market, and just get lost exploring in the city. Thanks for sharing! This is a really cool experience and something we’d look into when we go to Thailand. Love the tattoos too! It’s def a unique thing to do in Thailand and getting a sak yant in Chiang Mai will be something you’ll always remember. Hi! After bookmarking and reading (and rereading!) this lovely story multiple times, I decided I wanted to do the same when I visit Chiang Mai this year! I actually tried reaching out to WSE through their website (through their email then again through their website form) with a few questions but no response to either. Do you know if they are still doing these? Yes, they are still doing these tours. We have reached out to the owner of WSE to get in contact, this isn’t normal they are usually very good at responding. Let us know if they don’t get back to you. Have fun in Chiang Mai! You feel with the sak yant now any magic results ? We love our Sak Yant tattoos. When we return to Thailand we’ll probably get a Sak Yant in Bangkok. So far our Sak Yants have lived up to what they are to protect us for. Are you planning on getting one? I love the intro paragraph in this article! Almost poetic, I was drawn in to read more! My wife Sara and I plan on getting in in Thailand in a month or two, whenever we get there on our backpacking journey. They won’t be for protection but they definitely will be with this traditional bamboo rod technique! Nice and interesting article to read, makes getting a tattoo seem less painful and fun.. 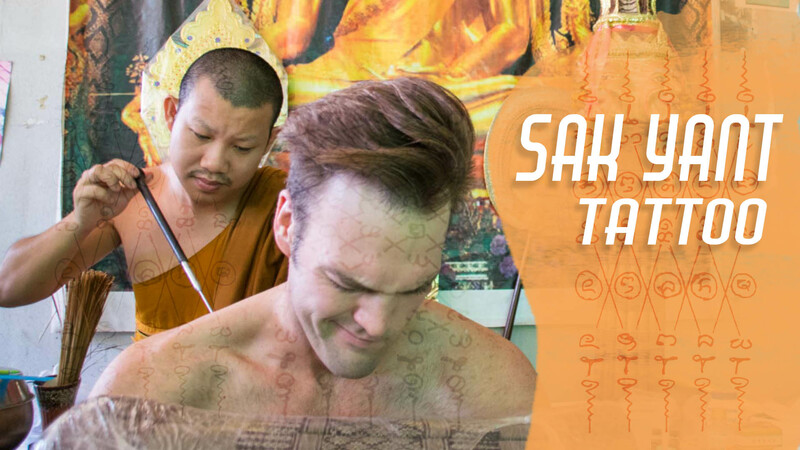 If you are looking at getting a tattoo and are traveling to Thailand definitely consider getting a Sak Yant tattoo in Bangkok or Chiang Mai for the ultimate souvenir! We are sitting at the same place you got yours and my husband is getting his dragon right now by the same monk. I was doing a little research on my Sak Yant when I came across this blog post. When I saw the picture of your guy getting his I had to do a double take at our monk before I realized it was the same one in your pictures. I am so excited to get mine!! No way! Did you book the Lanna Ink Experience? The Ajarn did an amazing job, it’s almost a year ago we got our Sak Yant tattoos in Thailand. What Sak Yant did you get? What did you think about the pain? It’s totally worth it and the best travel souvenir you can ever get. Nice article 🙂 ‘Khem Sak’ actually means ‘Needle Tattoo’ – Khem being the Thai word for needle. I also did a sak yant tattoo, one week ago. It was such a magical experience, i felt the power from the tattoo so good afterwards that i desided to get back after a couple of days and did a second one. When i was reading this above, i saw that i got the second tattoo from the same monk as you. No way the same monk!?!? Did you book with Where Sidewalks End? Are both tattoos on your back? I am sure we’ll get another one when we are back in Thailand next. Hi Hannah. Great article! I just came back from Chiang Mai and got my first tattoo and Sak Yant by Monk Rung as well. He was wonderful and custom designed something for me based on what I want from life. It was a great experience. That is great to hear! Did anyone else go with you or were you the only brave one? It’ll be the best travel souvenir you’ll ever have. Can’t believe we’ve had ours for over a year now. Could you tell the address or name of the temple where the Ajarn Run is? Getting a Sak Yant tattoo is an amazing experience. We booked our trip with http://www.wheresidewalksend.com/?connect=42 so they brought us there not sure the exact address. We highly recommend booking with them. Are you looking at getting a Sak Yant? Hey, how much did you actually pay for the tattoos? I’m going to Thailand in couple months for a 2-month long trip and I’d really like to get Sak Yant tattoo. Though you wrote it usually costs around 1000-1200B, the WSE actually wants 250$ for a tattoo… Do you happen to recommend any other organizations that accompany you with the process? Great blog, btw, I love it! We went with WSE and the tattoo was included in the tour price of $250. I will say they are totally worth it. We didn’t go with any other company so I cannot comment on them. You can try and seek out a local ajarn that can give you a Sak Yant and that will cost 1,000 baht and up depending on the size etc. However, finding such ajarn will be hard and they most likely will not speak English. This is why we advise going with WSE, who have been using the same ajarn for years. You will be picked up and taken outside of the city to the ajarn, have a local guide that will translate everything so you know what’s going on etc. You might want to ask yourself “Do you really want a cheap tattoo?” A tattoo is one of those things in life you don’t want to skimp on. First of all, no, I don’t want a ‘cheap’ tattoo, not at all, I want a ‘real’ one, that’s why I want to arrange it with someone who knows what we’re doing better than I do (despite all the research) and most of all – speaks Thai. I just asked because we’re going on a budget tour (and taken that we’re students from Poland – 250$ is like, more than half of our monthly salaries) and we would like to meet somewhere in-between that much money an a ‘cheap, impersonal’ tattoo. Anyway, I’ve done some more searching and I think I found something we can afford after all. What happens if one goes in salt water? 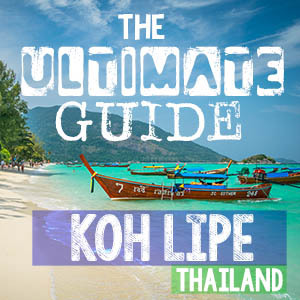 This sounds like an amazing experience, one I’m quite interested in, but we go to Koh Samui after Chiang Mai and I can’t imagine not going in the water at all! Hi Hannah!!! I was reading your story and it has inspired me to get a Sak Yant tattoo with my future husband on our Honeymoon. We’re very exited about it however still kinda worried about the hygiene. Can you tell me a little bit more about this? If we do it we would totally go with WSE travel though we saw a not so positive review on their facebook page the other day. I would love to get a little bit more insight from you if it’s no bother. What a honeymoon that would be. If you have ANY questions about the process or hygiene def reach out to the owner of WSE Ian, he is great and he can answer any question you have. Tell Hannah told you to ask him lol. I did just read the last review you might be referring to. So it appears they got their tattoo in Bangkok, I got mine in Chiang Mai. None the less, most people in Bangkok don’t have a car for many reasons and taking the train makes more sense for several reasons. The person reviewing seemed annoyed they had to walk to the street, so I think they may be a complainer…I also wonder if they asked the guide to translate for them. If they would have asked I am sure he would have. I was asking a ton of questions because I wanted to know about the ajarn, our guide, the history etc. Let us know if you have ANY other questions on Sak Yant or Thailand in general. Yes, we’ve been in contact with WSE with tons of questions. Though I wanted to ask you as a third party observer with no strings to the company. Where you able to see the cleaning process the Ajarn took to sterilize the equipment? I love the fact that it’s not just a tattoo, it’s a blessing! I really can’t wait to have this experience!! We will be visiting Bangkok, Phuket, and Chiang Mai. If you have any suggestions on other tours we could sign up for that would be great! Thank you for your help and guidance! You are able to see the cleaning process used. The Ajarn uses a latex glove and disposable small ink tray. The only thing that is reused is the needle which he sands and cleans with alcohol. If you have questions on any of it while you are there the ajarn or your guide will explain it or address any concerns if you have them. This is definitely not the gruesome situation you can sometimes find at the popular temples for Sak Yant, it’s probably as clean of a place you’re going to find with a true ajarn. Sorry for the delay in response, if you have any more questions please ask and we’ll try to get back to as soon as we can! Safe Travels! Wow, quite informative! I’ve always wanted to try something like this. Having tattoos Looks amazing. It is a tattoo with a story that’s for sure. I am sure you will get a tattoo some day soon. This is brilliant! loved every minute of reading this. So very informative. I hope these tattoos still stay sacred in a way. I would hate for it to become the “in thing” of backpackers everywhere. It seems rather special. I appreciate that you put all the rules down that we otherwise would never of known. I’ve never heard of this type of tattoo! I’ve heard about Apo Whang-Od in the Phillipines, and loved the idea of getting spiritual tattoos that really mean something. Southeast Asia just keeps climbing higher and higher on my list. Thank you so much! I’m really excited at the prospect of this! The tattoo turned out beautifully! I’ve been fascinated with these kind of tattoos ever since I met someone who had one seven years ago in Spain. Unfortunately I’ve never been to Thailand but if I get the chance to go I’d might consider getting one. Thanks for letting me know about the Sak Yant and the associated customs , rituals and rules. Its quite interesting to know about cultures and traditions of other places . When you interweave it with a tattoo in the core of your narration, it makes the post all the more interesting. I love what he said about crying because of the magic. I didn’t cry but he asked me at one point if I was going to cry. I said no and he said it is because I am strong. haha Great post. You guys are my tattoo bro and sis. What an amazing experience! We love tattoos and always get them as often as we can. We prefer them to symbolise something/an experience. We’ve got tattoos while on holiday – but nothing ever like this! Absolutely love it, adding to the bucket list! This was super interesting to read! I’ve heard about these tattoos before, but never with such in-depth information. I feel like more and more people are getting them though, so I’m not sure I would do it. It’s surprising to hear that it doesn’t hurt more than getting a tattoo with an electric needle! I have already read recently about the possibility of getting this special tattoo, it sounds like the lifetime experience… too bad I am not the person who would like to have one, maybe in the future, who knows 🙂 thanks for all those detailed information in your post! This was such a great post and I wish that I had gotten one while I was there! I love the concept behind it and that it protects you while traveling. Wish I could have met up with you guys when I was in Chiang Mai! I thought to get one of them when I went to Thailand 3 years ago but finally I didn’t make it (I really don’t know why uhauhauh)! Well, I will have more chance to go back to Thailand in few years and maybe I will think seriously to make a new tattoo, in Bamboo style! thanks for sharing it, your blog is brilliant and I am a real followers of your adventures!! This was such a good read. You are a great story teller I must say. The tattoo look just fabulous and i am sure that it must have been an amazing experience. It has been a long time I wanted to have a tattoo on me. Maybe something with my daughter’s birth day or something like this, but I always find an excuse for myself. Now that I saw you guys sticking a huge needle into your back, I realized I am not brave at all!! What a cool experience that will last a lifetime. It’s great that your tattoos are more than just random decorations, but are meaningful expressions of great values. And they look awesome! Such a comprehensive post. I love that you took the time to tell the back story of the meaning behind the tattoo, the practice, and the ceremony. I think after reading this that I would even consider getting one of these. A traveler can never have too much protection. That is very touching… I didn’t know getting tatooed by a monk can be such a moving experience. The pattern is indeed amazing. I love tattoos with a story – thanks for sharing yours here! Will keep this handy for when I’m in that part of the world again. Thank you for including so much detail in this post! It answered a lot of questions that I had about getting a Sak Yant tattoo. The finished product looks amazing on you and Adam! I doubt I will ever get a tattoo, but if I was going to be tempted, something like this with meaning would do it. I also really like these designs. Hahah, crying because of the magic, I love it! I’m not a huge fan of tattoos on myself and the way its treated in Western societies is just get things without meaning but as a student of anthropology, I celebrate the visual identity of different cultures and this certainly has meaning. I’m glad you took no photos and respected the traditions in place. Your tattoo pattern is beautiful! Thanks for sharing your experience. Interesting to learn about your experience and also the history of them. I don’t know if I could get one not knowing what it would turn out as but I’ve been waiting a few years to perfect what will likely be my first tattoo. If I ever get a tattoo I’d like to to be the Sak Yant tattoo. Safety would be a huge concern for me, so going through a reputable company is a great idea. Some of those rules for the monks are definitely interesting! It was definitely interesting to read about the rules of conduct and traditions surrounding sak yant tattooos. I was especially interested to learn about the rules regarding women getting the tattoos. It is apparent that the tattoo you got has a lot of meaning, so I doubt it is something you will regret–even down the road. Thank you so much for posting this! I have been wanting to get one of these tattoos for awhile now, and honestly didn’t even know where to start on how to even arrange to get one. Now to convince the hubby we need to got Thailand. If your mom approves, then it’s all good. I don’t think mine would ever approve and would probably kill me as well! “you are crying because of the magic” certainly everything feel more special! Wow. I never knew there’s something like a Sak Yant Tattoo. I am so digging this. Would be researching a bit More on this. Thanks for the lovely post. Beautiful pictures there! Love the story-telling of your article! Both tattoos look very nice too! Sounds like you had a great experience! I am so glad I got one. It’s def got a story behind it when someone asks me about it. Hope you two are staying warm in Europe. Most Sak Yants are on your back. You can tell him where but traditionally it’s up to him. I told him I prefer it on my shoulder and he picked the size. Def get one when you come back to Thailand! Love them., we are definitely getting them next time we are in Thailand! You have to send us a picture of your Sak Yant tattoo would love to hear your experience as well. Safe travels.